The third season of international theatre programming by ArtsEmerson: The World On Stage continues with a Yale Repertory Theatre production of "The Servant of Two Masters." Performances take place January 29 – February 10 at The Paramount Center Mainstage, 559 Washington Street in Boston’s Theatre District. 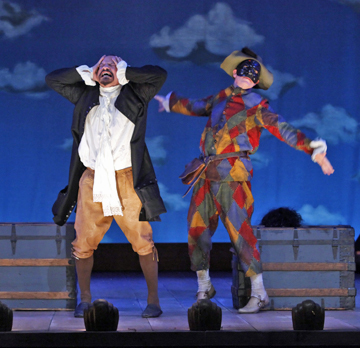 In Carlo Goldoni’s commedia dell’arte masterpiece (adapted by Constance Congdon from a translation by Christina Sibul), identities are mistaken, engagements are broken and lovers are reunited. Mayhem erupts when the wily -- and chronically hungry -- servant Truffaldino (played by acclaimed actor Steven Epp) hatches a zany scheme to double his wages (and his meals) by serving two masters at once. The virtuosic physical comedy of "The Servant of Two Masters" is directed by Christopher Bayes, whose inventive choreography is featured in the acclaimed stage production of "Alfred Hitchcock’s The 39 Steps." Christopher Bayes’ credits include six years as an actor, director, composer, designer and artistic associate at Theatre de la Jeune Lune. In 1989 he joined the acting company of The Guthrie for more than 20 productions. His New York and regional directing credits include work at Juilliard, P.S. 122, Intiman, Court, and Yale Repertory Theatre. He is a 2000 Fox Fellow, and currently the Head of Physical Acting at the Yale School of Drama. Actor Steven Epp was last seen in Boston in "The Miser, Don Juan Giovanni and Figaro" at the American Repertory Theater. The recipient of a 1999 Fox Fellowship, he was a member of Theatre de la Jeune Lune and has also performed at La Jolla Playhouse, New Victory Theatre, the Alley Theatre, Actors' Theatre of Louisville, Yale Repertory Theatre, Trinity Repertory Theatre, the Shakespeare Theatre and Berkeley Repertory Theatre.